Imagine yourself drinking a beer, sitting by the pool, and watching the sun go down. Can a picture truly capture your enjoyment? Thanks to editing services offered by BoxBrownie.com, it is possible. 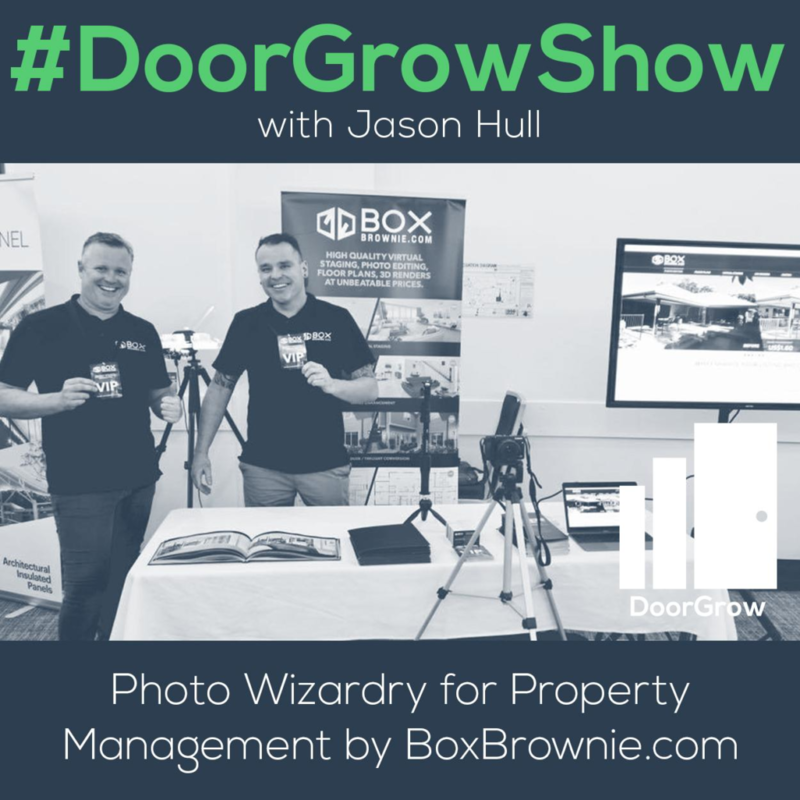 Today, I am talking to Brad Filliponi and Peter Schravemade of BoxBrownie about their online marketing tool that helps others publish quality marketing photographs to get people to their properties. [01:50] Background of BoxBrownie: Brad was previously a real estate photographer who had trouble finding people to edit his images. Peter is a real estate agent who believes quality marketing can be done for less money. So, they developed an online marketing tool for estate agents, photographers, and others to easily publish marketing materials. [03:45] The BoxBrownie website features quality output and samples of what can be done. The amazing photos help people envision what is possible. [06:35] Virtual Staging: BoxBrownie offers virtual staging of properties and rooms that are mapped out in 3D and where furniture is placed. You can select from the following styles: modern contemporary, urban industrial, Scandinavian, farmhouse, or customized. [07:18] View samples of virtual staging. [07:31] Virtual Renovations: BoxBrownie takes an unfinished room and adds furniture, appliances, and fixtures for renovations. Then, clients are given something they can use to instantly market the property for sale or rent. [09:05] BoxBrownie offers image enhancement editing for just $1.60. In a 24-hour turnaround, any photo from an amateur or professional photographer is taken and made to look 1,000x better for MLS listings. BoxBrownie has preset edits that polish your photos. [10:00] Many property managers use the image enhancement edit product because they do not have the budget to hire a photographer or they don’t have the time to fix photos. [10:33] Twilight Conversion: BoxBrownie takes an existing property that has been photographed in daylight and is converted to twilight. Day-to-dusk conversions are clicked on more often than daytime shots. It costs $4 and has a 24-hour turnaround. [12:35] Item Removal: Remove clutter and clean up the photo. BoxBrownie can remove cars, statues, paintings, etc. Some items can turn people off, so eliminate bad vibes – and items. [15:02] Drone Editing: This service is if you want to highlight a lot or pinpoint the location of a property, such as to identify schools and landmarks. The cost starts at $2.40. [16:43] Turnaround time from BoxBrownie is 24-48 hours, depending on the type of editing or enhancement service selected. [17:23] BoxBrownie is currently creating an API and in discussions with property management software companies to provide its services. [17:50] If marketing a property, make sure to have a floorplan. People tend to not look at your property if you don’t have one. The price frame is $24-36. [20:23] Custom Jobs: Customers upload images or floorplans and provide a description of what they would like added, changed, or removed. [21:05] 3D Rendering: Photorealistic or 3D image of a property that does not exist. BoxBrownie creates an image of what the property will look like. It costs $280. [22:23] Email product suggestions and feedback to BoxBrownie. [22:45] Copywriting: BoxBrownie can write content to go with your pictures of properties to market them. [23:15] BoxBrownie contact info – go to BoxBrownie.com to sign up for some freebies and $40 credit. Just use the coupon code: SHOWMETHEMONEY. Put it up on the market and showcase possibility. You’ve got something to instantly market the property. Day-to-dusk conversions are clicked on more often. Jason: We are live! Jason Hull, DoorGrow Show here. I’m hanging out with Peter and Brad from BoxBrownie.com. Say hello, guys. Peter: How are you doing? Hi. Peter: Thanks for having us. Jason: You guys are hanging out in Texas right now, but you guys have these really cool accents, so why don’t you tell everybody where you’re from. Jason: See how Texas is looking right now? Is it pretty wet down there? Peter: We got to Houston yesterday. So no, it’s been pretty good weather. Prior to that, we’re in Austin and Dallas. We’ve missed it all. We were just looking at the aftermath today driving around. It’s pretty horrific, some of that sweating. Brad: Pretty sad for lots of highlands. Jason: We had Steven on over there, Steven Rosenberg from Empire. He was giving us the rundown. It sound pretty crazy watching updates. Cool, I’m excited to have you guys on today. In preparation, I was checking out your site along the way by some of those images and it just looks really cool. Maybe starting out, you could just give us a little bit of background on you and how you came up with this business and this idea and then we can get into what you guys do for people. Brad: My name is Brad. I’m the co-founder of BoxBrownie.com. I’d been a real estate photographer for over 15 years and there comes a time when you can no longer edit your own photos, and as a photographer you can shoot more if you’re outsourcing. At the time, I tried numerous websites all across the globe and there was just no easy solution. I really thought, hey, I have to try and do something about this. It’s sort of what we created with an online marketing tool for state agents, photographers, builders and developers where we just publish marketing material and just make it really, really easy. Jason: Okay cool. Do you want to chime in? Share a little bit about yourself too? Peter: Yes. My name is Peter Schravemade and I came on board about 18 months ago, I’ve been a real estate agent for my life as long as I can remember. Short term, long term, leasing, and sales, I’ve even done a stinting commercial. Same old spectrums and run offices. I guess the premise behind BoxBrownie is so much of the marketing that we see on MLS or wherever it may be is done quite poorly in my opinion. There can be so much done to that marketing for not much money. That’s really behind the BoxBrownie drive, is that it doesn’t really matter where you’re at, what you’re doing, whether you’re selling, whether you’re leasing, whether you’re owner of the business, whether you’re the admin, or office staff member, we think we can take what you are looking at at the moment and make it look heaps better for as low as $1.60. Jason: I was really blown away by looking at the website. The costs, I know, because I have designers on my team, I know how expensive editing can be. I was surprised at the low pricing. But some of the photoshopping or the photo wizardry that you guys are showcasing on your website, it just really looks unbelievable. It looks incredible. Is that the very best examples or is this typical of the work that you guys put out? Peter: Obviously we like selecting good examples, but we think it’s fairly typical of what we put out there. In all honesty, we’re not going to show you our worst jobs, are we? Our output quality is really high. We have quality assurance, people to check that. At the very basis of what we do, it starts out as just an input, it comes through to us, we check it on the way in to make sure the job matches the product, and then we check it on the way out before it hits you. We’re quite proud of the quality of the editor we’ve put together and the edits that they’re doing, they’re actually relevant to the properties that are being placed under them anyway. Brad: I’d love to add here that our clients have a free rework option. If they’re not happy, they can hit a button and just make changes on the fly. And our quality control team, we’re quite fuzzy too, so if we see something we don’t like, we just hit a button and do it ourselves. If we know we can do it better, we’ll produce that and send it straight back to our clients even if they didn’t even ask for it. Brad: If only it was that easy. Peter: I’m going to be cleaning my bedroom again. I wouldn’t even have to make my bed. But anyway, it’s a testament to your work, a testament to the quality of what you guys are doing and I think it’s just really cool that somebody could take these photos of vacant property and they can then put it up on the market and showcase possibility as far as that. This also goes for even remakes and remodels. Peter: Yeah. The first product that you are talking about there, the virtual staging product, we work long and hard on that. We have CGI. They map out the room in 3D and they place furniture into it. Realistic furniture, they’re all high res, it comes back at the same resolution that you submitted. You’re given a choice of styles of furniture. You might choose modern contemporary, urban, industrial, Scandinavian, or farm house are the four that we’ve got at the moment, or you may have your own style where you can upload an image from Google and say, “I would like it to look like this style.” We’ll do our very best to cover it as far as that’s concerned. You may even draw on the images as to where you want the furniture and we’ll duplicate that. In fact, if you visit right now BoxBrownie.com/virtual-furniture, you will see examples of where people have drawn the furniture in that they have wanted and then we’ve staged it accordingly. The second product that you were talking about, virtual renovations, that’s brand new. To the extent that we will take an unfinished room and we will not only furnish it, we’ll add the fixtures into it as per the spec of what you would like to do as far as the renovation is concerned. Let me give you an example, I think you call them flippers? You have a flipper who will see potential in a property that maybe no one else does. They will purchase that property. Before they’re even settled on the property, they can send us the images of the unfinished property, they can send us the floor tile that they’re wanting to add. They can send us the appliances that they’re looking to install into the kitchen. I don’t mean send the actual appliance, I mean send us the Google links to them. Please don’t send us appliances. They can even send us the color scheme from your local painter that you’re intending to color the wall. We will finish of the room itself to your spec. We’ll add the furniture into it and we’ll send it back to you. There you’ve got something that you can instantly market the property toward the sale or to arrange in whichever way you want to. Jason: That’s incredible, picking different styles of furniture. If we ever actually end up getting absorbed by AI into the matrix, then you guys are going to be my interior decorators. Fair enough? Peter: Yeah. Deal. I’m hoping it doesn’t happen. Jason: What are some of the other products and stuff that you have, because you’ve got more in your lineup, I think. Peter:At the start, the basis of how BoxBrownie began is an image enhancement edit. It’s $1.60, it comes back to you overnight. The image enhancement edit is to take any photo that either a professional or an amateur photographer has taken and make it look 1000 times better for MLS. Brad will tell you. Brad: Yeah. I’ve been shooting property 15 years and I suppose I actually needed more but I used to put all my images through. Every edit a professional photographer would do gets done to your images for $1.60 each. Things like if you shot on an overcast day, we’ll replace the sky, we can green the grass if you want, lighten, brighten, and all that sort of thing. We’ve got preset edits, that we like to call it, that really just polish your image and just show it in its best light. Peter: That’s the edit that is particularly big amongst property managers because they find themselves in scenarios where they don’t have the budget to get a pro photographer or they don’t have the time frame. They’re out in the property right now and they have to get it to the market by the weekend. They’re force to take the photos themselves. Take the photos, we’ll make them look amazing overnight, and then you’ve got them up online. And then what you do from that point forward is up to you, but you have at least got a starting point. That’s the basis behind the image enhancement edit. Our second biggest seller in the US is one that we call a Twilight Conversion or in Australian lingo, a Day to Dusk Conversion where we take an existing property that has been shot in daylight and we convert it to twilight. We’ll activate the lights in the house, we’ll give it a beautiful sunset, we’ll darken the front of the house so that it appears as though it’s a twilight. These Day to Dusk Conversions, we know, are clicked on more than the day time shots. The dusk shot becomes a hero shot for MLS, that’s the one that you would use. It’s a $4 edit, it returns to you overnight. There’s not too many realtors, brokers, agents that I know that wouldn’t select that edit as their hero shot for sales or for rental. Brad: Like as a hero image. It’s proven to be clicked more. If you can spend $4 and make that cover in each part, you’ll have a better click rate. Jason: I was really impressed with those. The beauty of it is that it’s showcasing the magic of light. If you get too dark, at night things can look really cool with lights and stuff like that. But if it’s too dark, the photo’s not very effective. And then if it’s just daytime, that’s okay. You guys, I can see, make it look beautiful on blue skies but there is something magical about that time period where you’re getting that presence of light and seeing the glow of windows and you’re seeing the sky is in that twilight stage. It really does look pretty impressive seeing you take a photo and change it to that. Peter: [inaudible 00:13:12] are in houses, surfing on their iPads and they try to imagine the space. This is also a point I’ll make on the virtual staging, they’re trying to imagine themselves in the space, they’re trying to imagine that furniture in the space, they trying to imagine what they’re doing in the afternoon in that space. When you create this magic Twilight Conversion, people are imagining themselves out by the pool having a beer while the sun goes down and that gets them to the property. There may not be anything wrong with the day to dusk shot, it will be the daytime shot but the twilight shot is the one that really pulls on the heartstrings and says, “Hey, I can imagine myself and my prospective partner out there having a beer.” I think that’s the idea of the Twilight Conversion. Peter: Let me tell you about the item removal. This is a big one in property management. If you ever been, as I have been and as he has, to a squatters property. I’m sure you understand what a squatters property is. Just torn apart, they have stuff everywhere. One of the edits that we have is an item removal edit where we can take things out. It doesn’t just have to be a squatters property, it could be your tenant doesn’t care that you are there shooting the property. They have clutter all over the bench. Brad: Bench shots, bathrooms. There’s products everywhere. We can remove it, make it look like it’s almost just vacant within reason, leave it so it still looks lived on, however really clean up a shot and the before and afters just honestly speak for themselves. Peter: Item removal can be anything. It can even come down to things that are different to your tenant being there. You might be shooting an apartment building and there a skip out front, and there’s a big garbage truck or whatever. And you obviously can’t move that. We can take it out of the image for you so that your photographer, whoever it is, doesn’t have to come back in five hours and shoot it again when the skip’s gone. Brad: Given the amount of times I’ve been shooting property and let’s say it’s tenants that have caused, and the tenant’s like, “Hey, the car battery’s flat. We can’t move the car.” We can just auto remove it out the driveway and it just looks like the home has no car. Jason: Some people maybe have a highly offensive statues sitting inside their house, you can say, “Hey, can we just delete this?” And it’s gone. Brad: It can turn people off. It’s been proven. It happened to me in the past. I think that way you just eliminate any bad vibes. Jason: Sure. You much rather have people say, “Hey babe, do you remember that really cool property we were looking at online that had the really cool photography?” Instead of, “Oh, no. It was actually the one that had the naked statue that was doing something with somebody else. That one? Yeah, yeah, yeah.” That has a different impression when people [inaudible 00:16:36] at the property. Peter: It’s still in the image enhancement. We do drone editing as well. If you have a drone shot, you want the lot to show out, or you want to highlight the property, or you want to drop pin the location and show where the nearest schools are, we do all of that as well. Brad: Shows the landmarks. In the one shot, you can really see where you’re buying into the suburb. It could be a local shopping center, school, playground, etc. Anything that’s going to grab any heartstrings. Jason: That’s cool. If they don’t have a drone, is there any way of doing anything like that? Like pulling from Google Maps or anything similar to showcase something? Brad: We have tried. It’s not really preferred because usually it’s all low resolution. We can only edit as good as the image we’re supplied. Drone photography is paramount, and the whole idea of badass service is to polish your marketing material. You want to look the best, you don’t want to look mediocre, or average, so we don’t recommend that. Jason: [inaudible 00:17:40] drone has come a way down on people. Peter: That’s it. You highlighted a great issue. One of the things about photography is a lot of photographers are able to do their own enhancement, which is fine. Even though a lot of them use our service as well, but the drone users, because drones are relatively new, a lot of them don’t come with enhancement and you don’t realize it that you don’t just set the drone up there and it looks amazing because you haven’t seen it before but it can look a thousand times better than what you get back. That’s $2.40, goes up from there. It’s not going to break the bank. Not many of our edits are expensive. Brad: Yeah. Everything, especially wholesale prices. Photographers use that all around the world and they put their margin on top because that’s how affordable we are. Jason: That’s incredible. Property managers can go submit the photos to you, the turnaround time is generally what? I guess it depends on product? Brad: Mainly overnight for most of it. Peter: All of our edits, except for the virtual staging that we offer and the 3D floor plans. We haven’t discussed floor plans yet. But the 3D floor plans that we have there, they are 48 hours. Everything else we guarantee back in 24. The reality is if you’re submitting them at 5:00PM, you’re generally going to get them back at night. The disclaimer to that would be if you’re going to submit them on a Thursday where every man and his dog are also submitting images, it’ll take up to the 24 hours. Just try and be clever about when you do it. Jason: Have you guys reached out to property management software companies? Because this sounds really cool. Do you guys have an API? Are you planning on an API in the future? Peter: Anywhere. Imagine [inaudible 00:19:57] to the MLS and you’ve taken it yourself and you can go just BoxBrownie, there we go. Jason: Yeah. Like, okay, we can market this property at normal level but let’s upgrade this, we’ll do BoxBrownie and check my toolbox and do that. That would be killer. Cool. What else should people know about BoxBrownie? Brad: Buyers get upset, to be honest. Peter: They don’t look at your property, buyers or tenants. I think there has been rigorous education of the people who are looking at property in Australia that looking at a floor plan will actually tell you something about the property that’s there. That aside, where it really does help, if you’re fine to rent a property and the outside appears quite small, the only thing that is going to tell your prospective tenant from the internet or from in front of the property that the property’s actually quite substantial is a floor plan. It’s the only thing. We do any kind of floor plan. From a very basic 2D black and white to a 2D colored texture to the little 3D dolls houses where you can see exactly what’s in there. Where there’s a place of the bed and whatever else. They range from between $24 up to $36 is the price frame there, the turn around is nearly all of them $24 except for the 3D. I’d throw that out there. I know it’s not a necessity here in the US. Peter: Yeah, definitely. If you wanted to point a difference on your properties and you really wanted to stand out from the rest of the crowd. Brad: Seriously so easy. Take a snapshot with your smartphone. Obviously preferred builder’s plan which some owners may have, snap on your phone, upload it straight us. Within reason it’s back the following day. If you don’t have any plans, you can literally just draw like a sketch, whether it’s to scale or not. We’ve got disclaimers we can pat in. We can really draw your sketch as well. It’s all on our website. It’s quite mind-blowing. Jason: That’s fantastic. I do see the value because some property managers are leveraging video to showcase and get people a tour but there’s something that I’m just seeing it from above and seeing what the layer of the floorplan actually is that just makes it so much easier to make a decision whether it’s going to work for you. Brad: And also, they even just check that all their furniture is going to fit as well, they just check the floor plan because I suppose if you got a floor plan, it’s a lot easier to remember if you don’t. Peter: Two more edits if you got time. Jason: Yeah, yeah. Tell us. Peter: One of it is the Custom Section. Anything that doesn’t fit into the product that you heard about here, you upload into the custom site, you give us any of the input files. It might be an image, it might be a floor plan, it might be whatever. You give us a description, “I would like to see what this house would look like with the fence removed.” We’ll come back to you with a quote and a timeframe very quickly and you can either approve that or otherwise. A lot of the custom section is the breeding ground for where we actually develop new products, like the virtual renovation products that we’re just bringing out now that started in custom section where a bunch of flippers came to us and said, “You know what, it would be amazing if you could renovate this in this way.” That’s the Custom Section. Anything that you don’t think is going to fit in. The second one, which doesn’t really apply to property managers but maybe a tool that they wish to refer on is our 3D render system. We’re quite proud of this, we won an Australian tech grant to develop and automated 3D render system. What a 3D render is is it’s a photorealistic image or a 3D image of a property that doesn’t exist. You might have a builder’s plan with elevations or CAD file, you submit them to us, we create what the property would look like [inaudible 00:24:20] and you’ve got something to market when you’ve got something intangible in front of you. You may be in a newer state and there’s a block of land sitting there but they know what house they’re going to put on it, we’ll create finished products so you can start marketing that to your property management and it’s cheap, it’s $280. Peter: Yeah. The turnaround is quick, it’s all fully automated. Brad: Yeah. You can upload the architect files straight into our system. It’s a world first. It’s so easy to [inaudible 00:24:53] builders, developers, they just love it. Because they don’t have access to it. Peter: On that, it probably doesn’t suit property management clientele but if they refer it to their builders or developers who are giving them the product, then they have something tangible to sell when they have a property that doesn’t exist. Jason: There are a lot of property management companies that do get involved in remakes, they get involved in remodels, they might have maintenance for certain things to be added or removed. This makes a lot of sense. Peter: Yup. You’ve got the full gamut of what BoxBrownie currently does. We’ve got things in the pipeline if you got any product suggestions, email us. Our email address is hello@boxbrownie.com, send us ideas, send us feedback, tell us what you’d like to see, where you like to see us go. Even if you got suggestions for us as far as products are concerned, we’re always listening. Brad: We listen, we modify our system to suit. Got a lot of products coming. I don’t know if we spoke about copywriting? Peter: No, no we didn’t. Brad: Another service we offer as well, professional copywriting which may or may not be in a use to your listeners but it’s always there. Upload a few photos, let us know what landmarks are nearby, floor plan if need be. Within 24 hours, we’ll give you some professional copywriting. Make you look awesome. Jason: You’ll write about the property, about the area to help them to be able to market it. Brad: We create all the marketing to make you look like a rockstar. So you can go out and do your job better. Jason: Yeah. I see, this is a fantastic resource for a lot for different industries. Very cool. So again, people can get a hold of you guys by going to BoxBrownie.com. Any final last takeaways or anything you want to share with the audience? Peter: Yup. I do have a takeaway for you. Any of your listeners today who visit BoxBrownie.com and sign up for free, they’ll get a bunch of freebies anyway. There’s a blue box in the corner where they can sign up for free, they enter their details. Once that [inaudible 00:27:06] 48 hours, they add the card, in all capital letters, no spaces, SHOWMETHEMONEY, they’ll get $40 free credit to start them off. They can try just about any of our services straight up. I’ll repeat that for you. Sign up for free, on the top right after you visit BoxBrownie.com. Once you’ve done that, go to the dashboard and enter where it says ‘Enter Coupon Code’, SHOWME THEMONEY, in capital letters, with no spaces, altogether, and you’ll get $40 credit to try. Jason: That’s fantastic! Alright. SHOWMETHEMONEY, guys. That’s fantastic. Alright. I appreciate that, appreciate you guys coming on. I’m excited to get feedback and hear from you guys after some of us, Americans, started using your product and [inaudible 00:27:53]. Sounds really cool. Thanks for hanging out with us on such short notice. Brad: Absolutely a pleasure. We really appreciate it. Peter: Flattered for you to have us on here. It’s great. Brad: We’re just here to help any way we can. Jason: Awesome. Okay, thanks guys. I’ll let you go and everybody check out BoxBrownie.com. I think this will be really cool to see. There’s so many use cases I’m thinking off the top of my head but it could be people that have had disasters in their area, that are about to do remodels, they could showcase what could be done and that is so powerful in selling to somebody to get them to do that, to get them to pay the money to do that. And they’ll say, “Yeah, yeah. That looks incredible. I will do that.” Really, it’s this power of helping people envision potential, I think is also very powerful. Really cool, BoxBrownie.com and we will end this. Bye everybody!